Exposes the attempts by developed countries to 'kick away the ladder' from developing countries trying to join the economic elite. How did the rich countries really become rich? In this provocative study, Ha-Joon Chang examines the great pressure on developing countries from the developed world to adopt certain 'good policies' and 'good institutions', seen today as necessary for economic development. Adopting a historical approach, Dr Chang finds that the economic evolution of now-developed countries differed dramatically from the procedures that they now recommend to poorer nations. 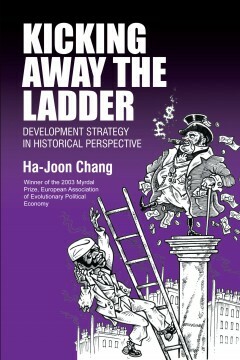 His conclusions are compelling and disturbing: that developed countries are attempting to 'kick away the ladder' with which they have climbed to the top, thereby preventing developing counties from adopting policies and institutions that they themselves have used. This book is the winner of the 2003 Myrdal Prize, European Association of Evolutionary Political Economy. Ha-Joon Chang teaches at the Faculty of Economics and Politics, University of Cambridge.